Please note that after placing an order you will have 7 days to complete payment. Extensions will be granted just as long as you remain in contact with us. If payment is not made within 7 days your order will be cancelled and the product(s) in your cart will be added back into our inventory. You are welcome to place an order again at anytime. We now ship $500+ orders to Canada and the United Kingdom. *Buyer agrees to a $25 first-class international shipping fee, and the purchase must be completed by using cash, a credit card, bank-to-bank transfer, or Bitcoin. Please see our shipping page for additional shipping options. When paying with cash please send the exact amount of paper money in a well concealed, stamped envelope. When you send cash in the mail it is always at your own risk. We cannot be held liable for any payments lost in transit. Send us an email requesting our mailing address and we will reply with it promptly. 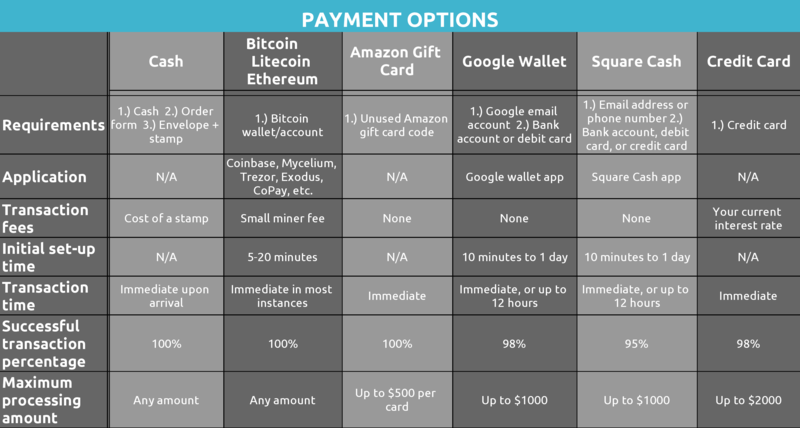 Cryptocurrencies are the safest and most secure way to pay online. Bitcoins, Ethereum, and Litecoins are all forms of digital currency that are entirely decentralized, meaning there are no third parties involved during transactions. One can remain completely anonymous. Theres no risk of identity theft. No personally identifying information is ever needed to complete a payment. Payments are sent from anywhere to anywhere within seconds/minutes. No waiting on banks to process your payment. Zero or low fees. Without a middleman, there’s no one to inflate prices. 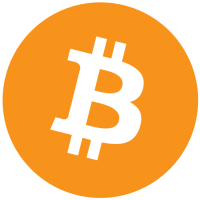 The decentralized structure of Bitcoin, combined with its impenetrable encryption makes it a perfectly secure, and free currency. Open an account online at Trezor, Exodus, Coinbase, CoPay, etc. Or try Mycelium, a Bitcoin Wallet that’s solely for mobile use!​ Please visit our payment info page for more information regarding Bitcoin and our payment options. Tired of those pre-paid cards that charge you a $5.95 fee and always seem to come with other headaches and hiccups too? Well, save yourself the trouble, plus the fees, and buy an Amazon Gift card instead! 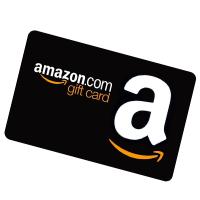 Or perhaps you have an Amazon gift card laying around, but you’d rather have seeds!? We’d love to trade with you. Your gift card… for our seeds. Its easy… You don’t have to call in to activate it, and you don’t need to mail it to us. Simply scratch off the code on the back, tell us what it is, and once confirmed we will consider your order paid for up to the amount of the card! Google Pay is the fast, simple way to pay in millions of places – online, in stores, your friends, and more. You can checkout in hundreds of apps without having to enter your payment information with the simple press of a button on your phone, tablet, laptop or desktop. Pay with ease on thousands of websites at no cost to either sender or receiver. A Google Pay/Wallet account must be linked to an existing debit card or bank account in the United States. Google will ask you to verify a small donation that they deposit into your account. Once verified, you can add money to your Google Wallet and can send money instantly at any time using your Google Wallet. 1. Download the Google Pay app for free on iOs and Android devices. 2. Follow the onscreen instructions to link your bank account and/or debit card. This verification can take up to 24 hours to complete, but once its confirmed you can send any future payments within seconds. Marketed as “the fastest, easiest way to pay anyone”, Square Cash is a peer-to-peer payments service that allows people to send and receive money from a mobile device or desktop computer at no cost to the sender. Square Cash must be linked to an existing credit card, debit card, or bank account in the United States. 1. Download the Square Cash app for free on iOS and Android devices. Or visit cash.me/ to sign up on a desktop. 2. Follow the onscreen verification instructions to link your bank account, credit and/or debit card. This typically takes 2-5 minutes time. Once completed you can send any future payments within seconds. *Enter the code ” cash.me/app/LMXRPSJ ” when you sign up and you will receive $5 free! We now have two options to accept credit cards. One may choose to complete payment using a credit card linked to their Square Cash app account, or we can send you an invoice with a second way to pay using a credit card.